I heard one time you should eat dessert first. I don’t remember where I heard it or the reason why you should do it, but it sounds good enough to me. 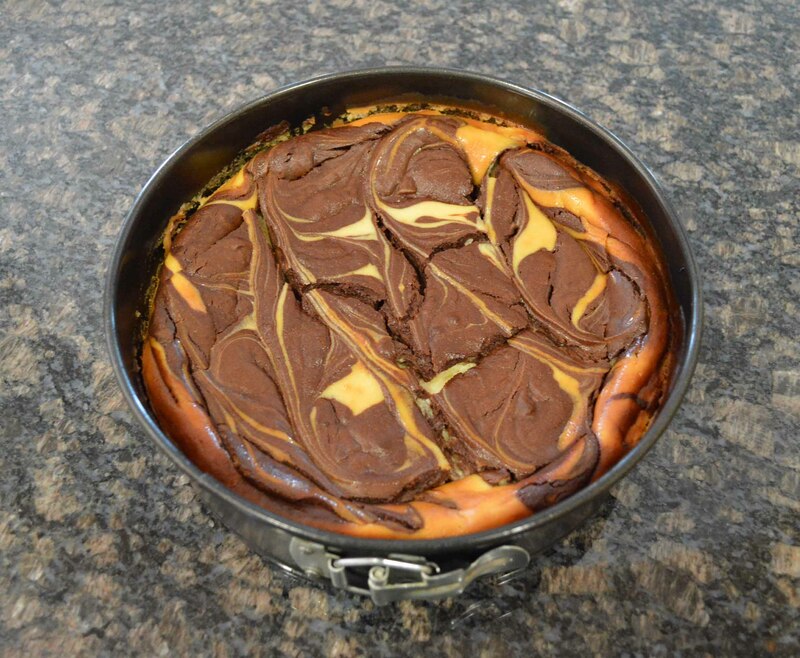 In that spirit, I thought I’d get the year started off right by sharing this Chocolate Marble Cheesecake Recipe! 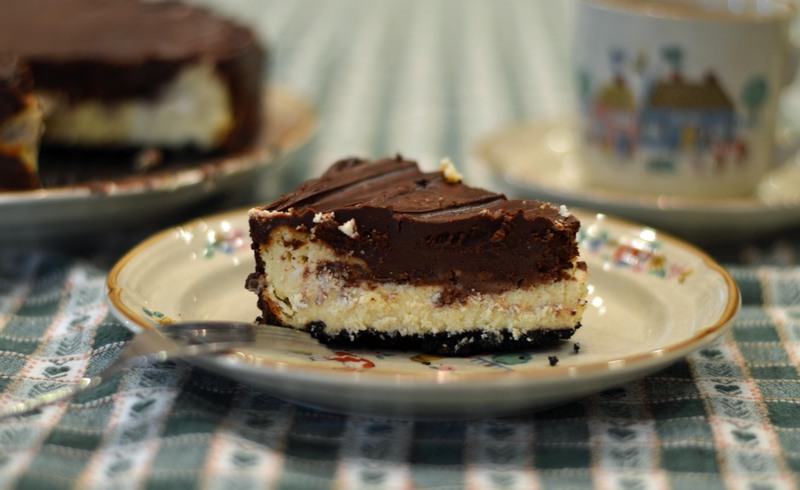 This cheesecake is rich, decandent, and easy to make; so in other words, it’s pretty much perfect. 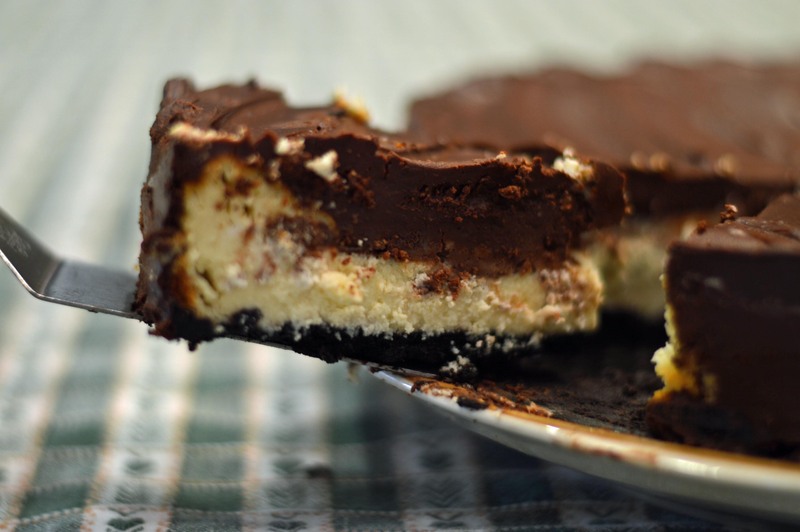 With that said, I have heard before that cheesecakes are hard to make. Obviously it wasn’t the same person who said you should eat dessert first. 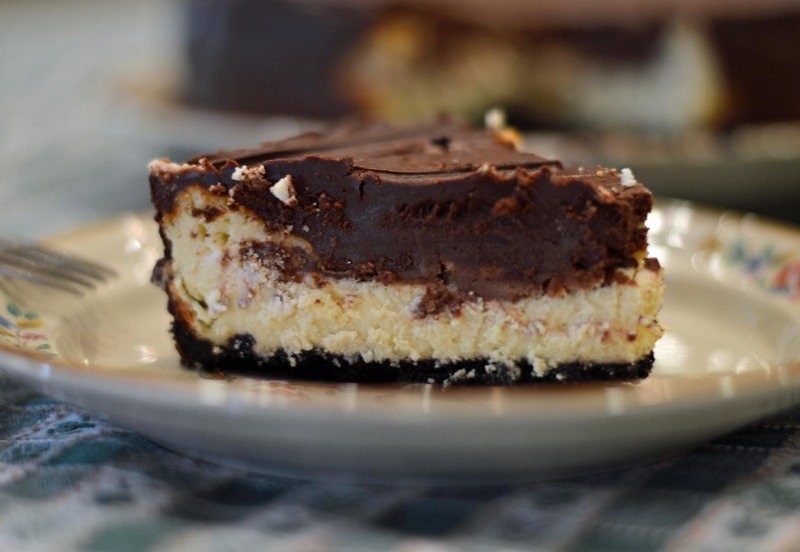 Cheesecakes are as easy to make as any other cake, and since this one has only eight ingredients, it’s pretty hard to mess up. Oh, it can be done, but the odds are pretty good that you won’t. So if you’ve never made a cheesecake before but really wanted a good recipe with the odds of success in your favor, well, here you go! Heat oven to 325 degrees. 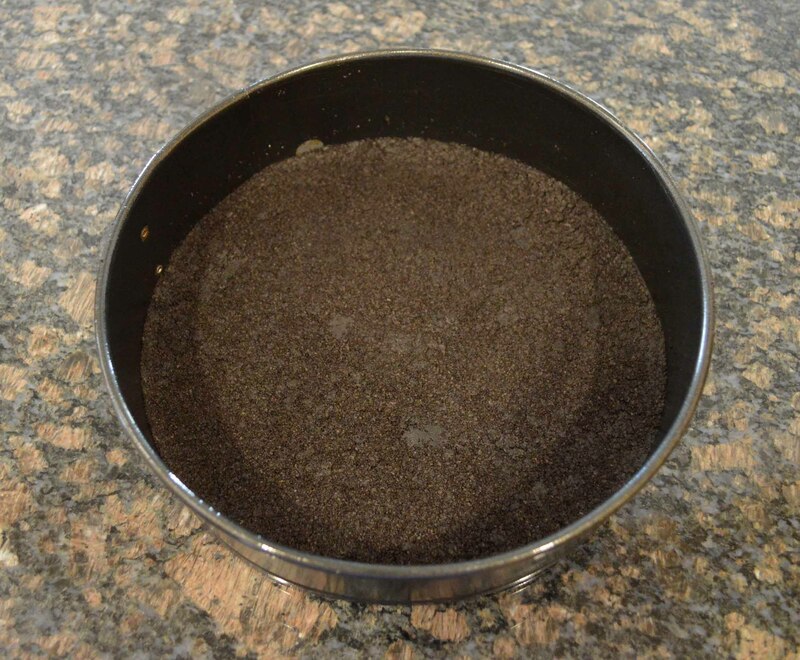 Grease a 9″ springform cake pan. In a medium bowl, mix melted butter and chopped chocolate cookie wafers. Press mixture firmly into the bottom of the springform pan and set aside. 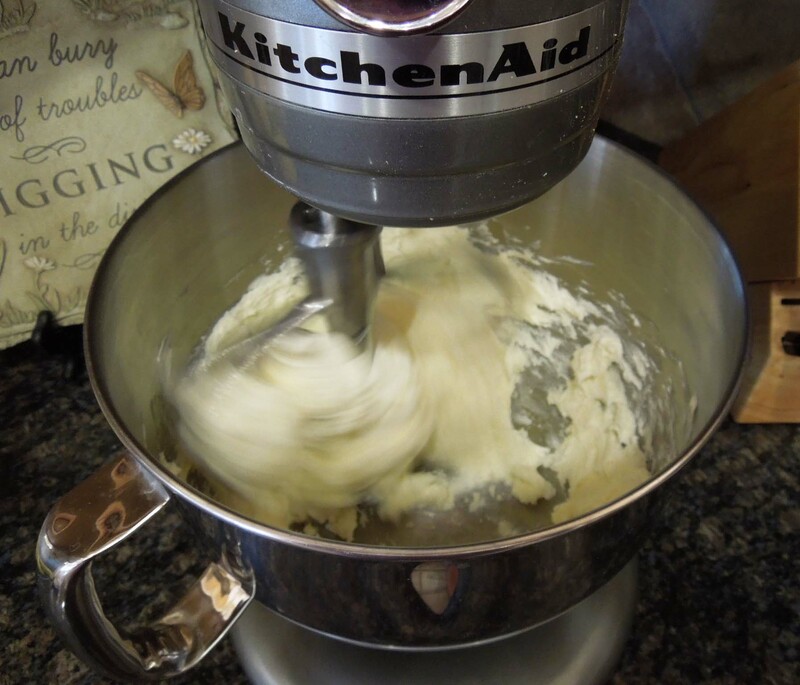 Cream sugar and cream cheese with a mixer set on low. Add sour cream and mix well. Add eggs one at a time until thoroughly mixed. Add vanilla and mix well. Reserve one cup of batter. Pour the rest of the batter into the springform pan. 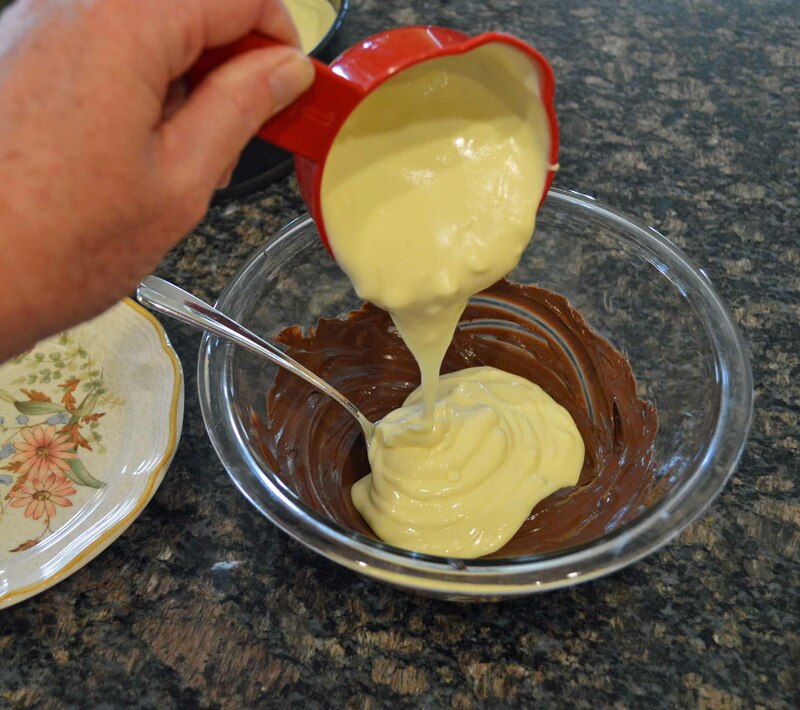 Mix the one cup of batter with the 3/4 cup of melted chocolate chips. Using a tablespoon, spoon into the springform pan evenly over the white batter. 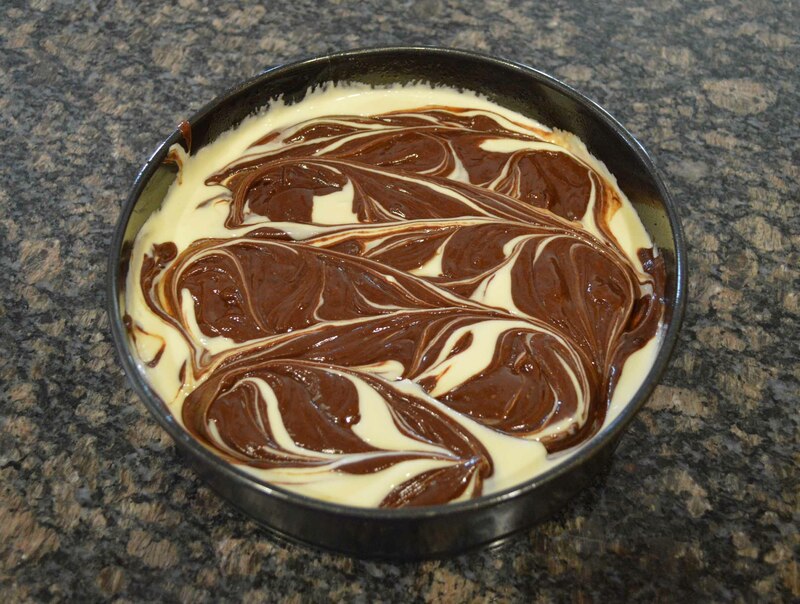 Using a butter knife, gently mix chocolate batter into the white batter until the mix looks marbled, being careful to not insert the knife all the way down to the bottom of the pan so as not to scrape up the crust. Bake at 325 degrees for 60 minutes. Cool on a wire rack until the bottom of the pan is cool to the touch, then refrigerate for at least 8 hours or overnight. 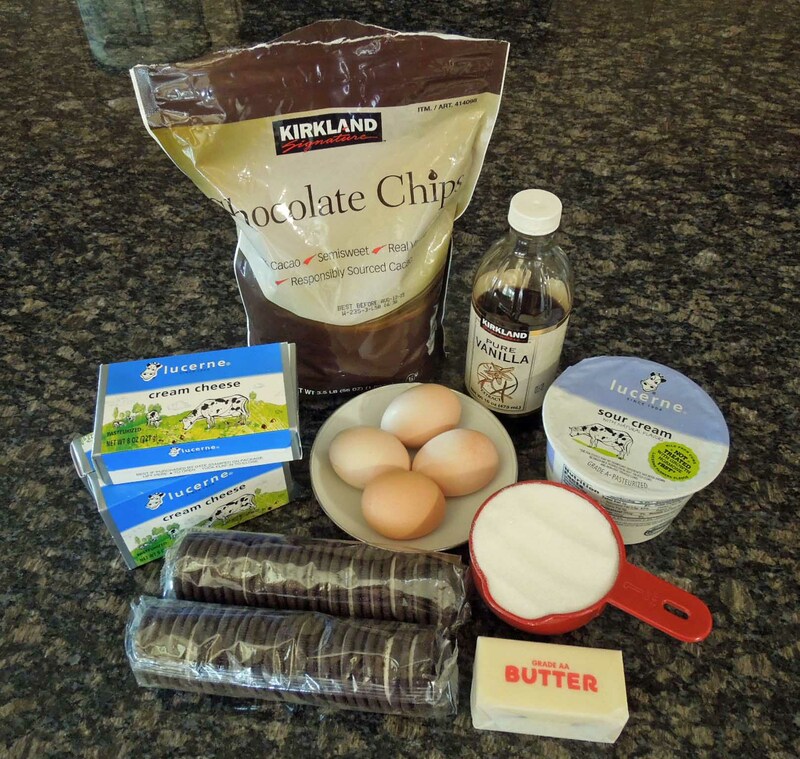 Mix the 1 1/2 cup melted chocolate chips and 1 cup sour cream until blended. Frost cake with a frosting knife or rubber spatula. Keep refrigerated until served. Refrigerate leftovers for up to one week. 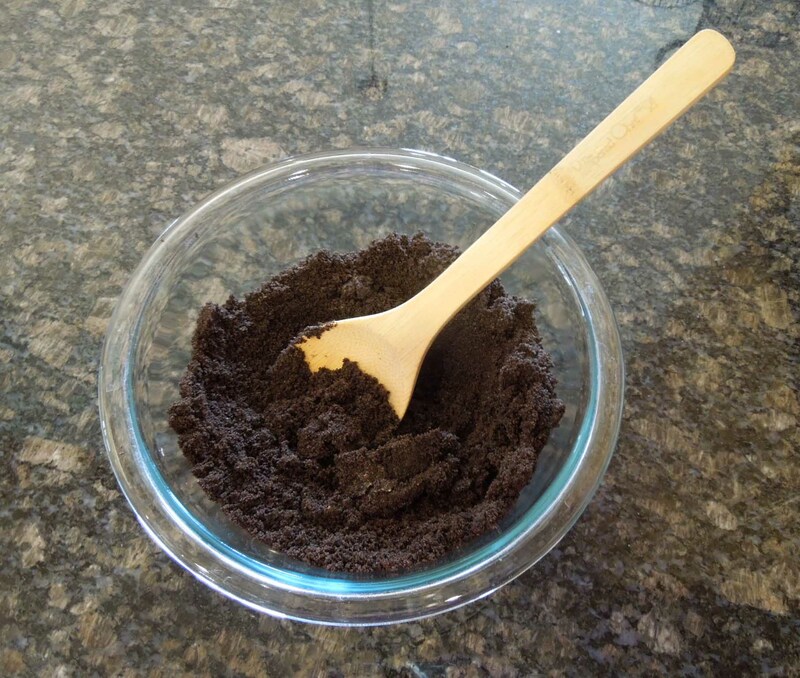 Below is a breakdown of the recipe directions with pictures. This should reduce the recipe failure rate to pretty much zero. Heat oven to 325 degrees. 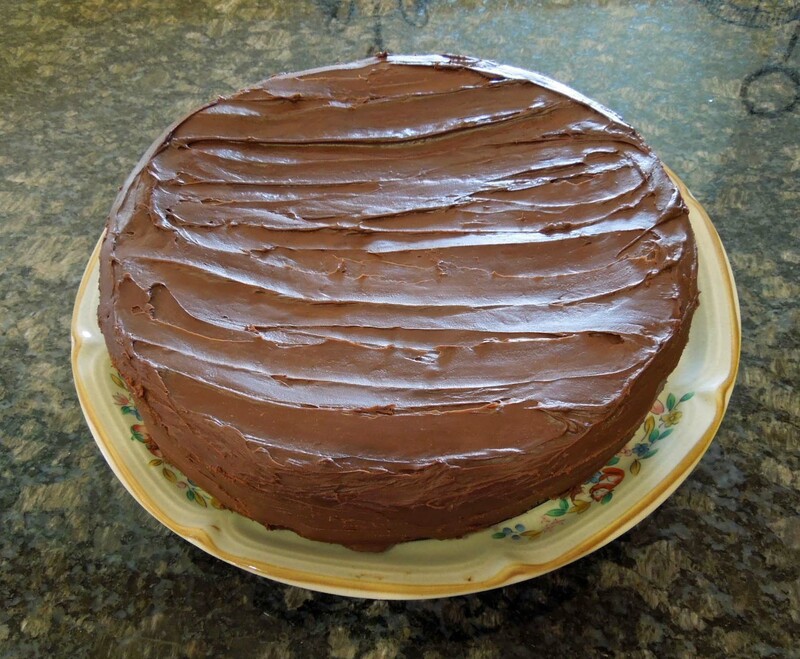 Grease a 9″ springform cake pan. In a medium bowl, mix melted butter and chopped chocolate cookie wafers. Press mixture firmly into the bottom of the springform pan and set aside. Cream sugar and cream cheese with a mixer set on low. Add sour cream and mix well. Add eggs one at a time until thoroughly mixed. Add vanilla and mix well. Reserve one cup of batter. 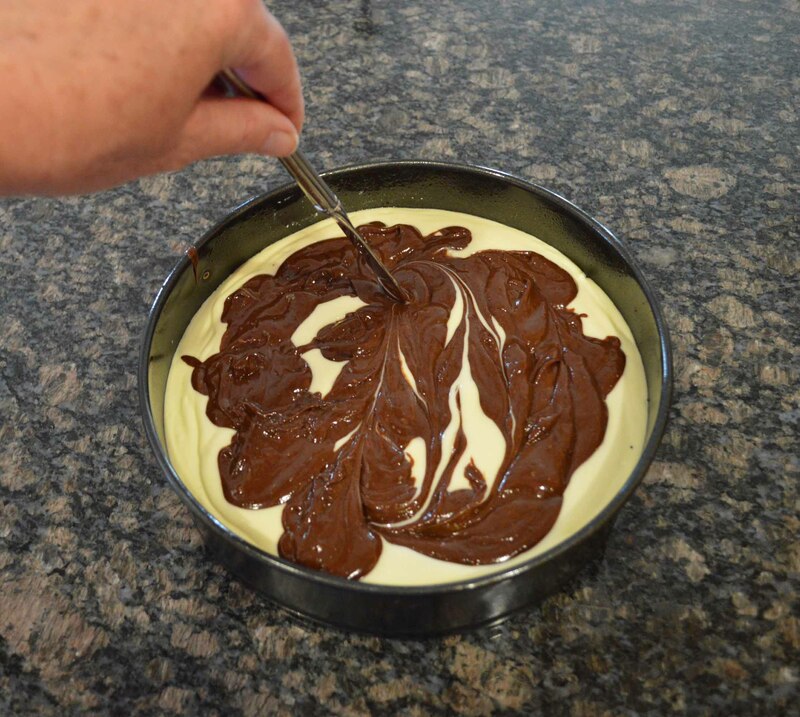 Pour the rest of the batter into the springform pan. 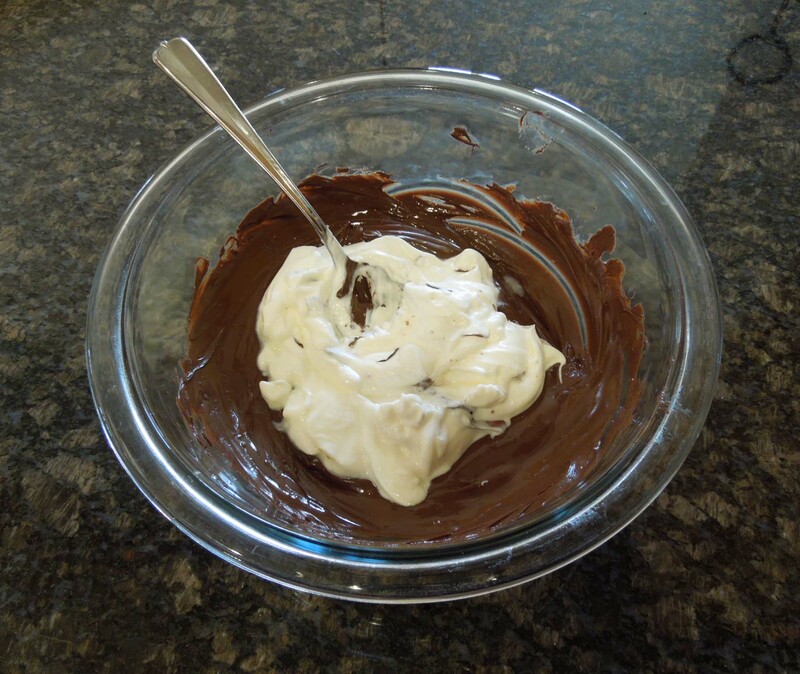 Mix the one cup of batter with the 3/4 cup of melted chocolate chips. Using a tablespoon, spoon into the springform pan evenly over the white batter. 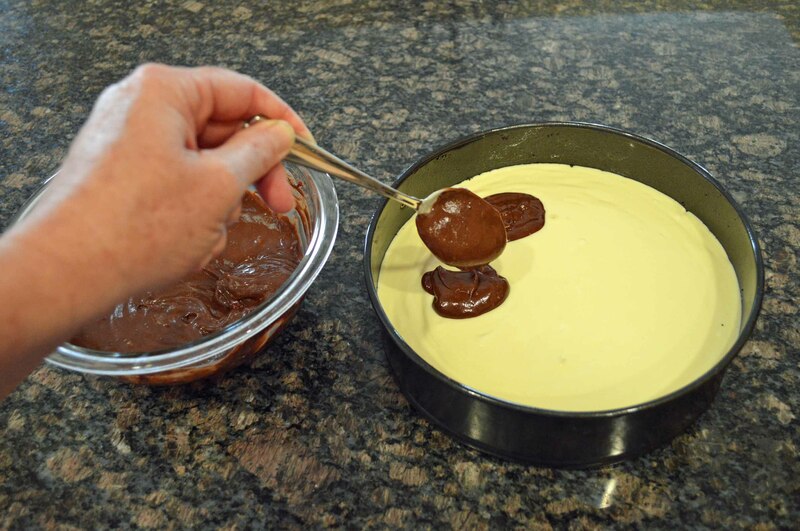 Using a butter knife, gently mix chocolate batter into the white batter until the mix looks marbled, being careful to not insert the knife all the way down to the bottom of the pan so as not to scrape up the crust. Bake at 325 degrees for 60 minutes. Cool on a wire rack until the bottom of the pan is cool to the touch, then refrigerate for at least 8 hours or overnight. Mix the 1 1/2 cup melted chocolate chips and 1 cup sour cream until blended. Frost cake with a frosting knife or rubber spatula. Keep refrigerated until served. Refrigerate leftovers for up to one week. I hope you enjoy this recipe as much as I do. Which is too much. Do you separate the cookie wafers from the cream inside them or just use the while cookie cream and all? Can’t wait to try this recipe. 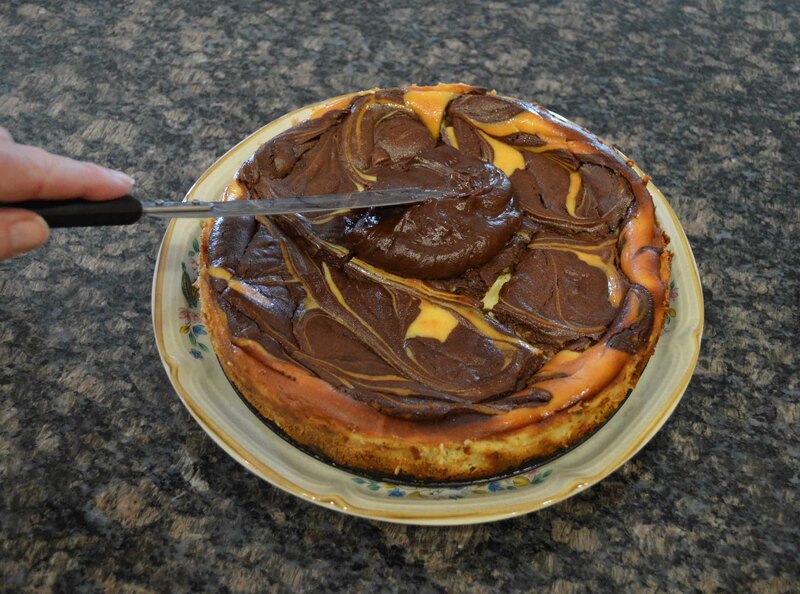 My hubby will be pleased too, he loves anything to do with cheesecake! Thanks i was wondering that! Life is short (uncertain), eat dessert first. That’s how I heard it!